Abstract tattoo patterns are often based on images from Celtic or Polynesian art, but they can also reflect a myriad of other interests and personal histories. Representational tattoos are still common, but abstract patterns appear in modern tattoos around the world, such as this tattoo inspired by an Eastern talisman. Tribal styles emerged from Polynesian and other ancient arts, but modern "tribal" just refers to bold, black or solid-colored lines that form graceful arcs - often in a mirror-image pattern. 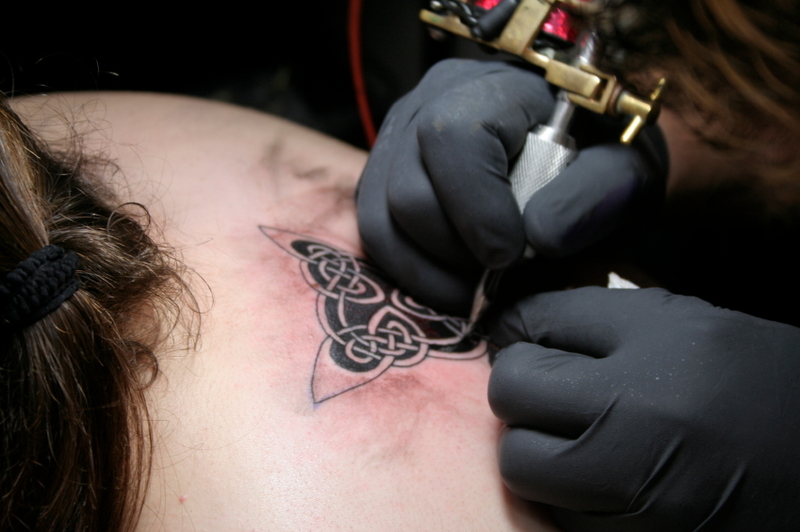 Many authentic tribal tattoo patterns resemble modern "tribal" style tattoos. The more painful traditional process had a traditional as well as personal meaning. This Samoan tattoo was done in a traditional style. The zig-zag line near the top and bottom of this pattern represents Fa'alaupaoga which means "like the leaves of a Pandanus tree." The Polynesian Islands are filled with a long tattoo history. Although the locals no longer practice tattooing as a rite of passage, some patterns are still in use, and you can still see the intricate work that once adorned the native people. Ancient Egyptian hieroglyphics, scarabs and ankhs carry thousands of years of meaning. Sources for unusual tattoo patterns are limitless. Consider tiny shapes, in the style of a charm bracelet, for a unique pattern that represents your personal interests and passions. For more inspiration from traditional tattoo designs, check out Buddhist Symbol Tattoos and Awesome Tribal Armband Tattoos.